Good. 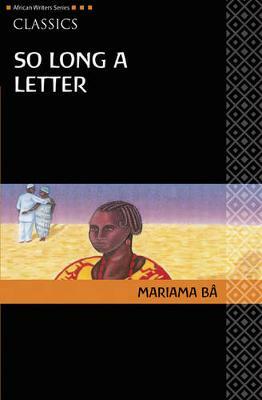 This novel is in the form of a letter, written by the widowed Ramatoulaye and describing her struggle for survival. It is the winner of the Noma Award. Trade paperback (US). Glued binding. 90 p. African Writers, 248. New. 2008. New Ed. Paperback. Series: Heinemann African Writers Series: Classics. Num Pages: 112 pages. BIC Classification: FA. Category: (G) General (US: Trade). Dimension: 200 x 127 x 8. Weight in Grams: 106. Series: Heinemann African Writers Series: Classics. 112 pages. Cateogry: (G) General (US: Trade). BIC Classification: FA. Dimension: 200 x 127 x 8. Weight: 102......We ship daily from our Bookshop.